Barcelona- I have written an extensive profile of Said Bahaji, one of the last members of the Hamburg cell still on the run (the other being Zakariya Essabar) in the new issue of Militant Leadership Monitor. 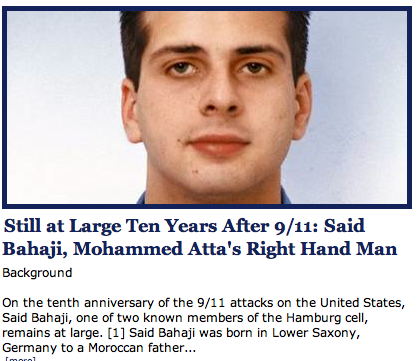 Bahaji was a core member of the 9/11 plot and one of it’s least known figures. With the death of Osama bin Laden back in May, Bahaji is one of the few men alive to have operational knowledge of 9/11. Bahaji is still being sheltered by certain Pakistanis, out of reach of everything but a Hellfire missile it seems. It would be a damn shame if we were to find out he had simply been obliterated in a drone strike rather than somehow captured alive. In fact, his logistical knowledge of the 9/11 operation makes him much more valuable to the historical record than bin Laden (if in a fantasy bin Laden had been captured alive and tried in a court of law rather than assassinated). If it were possible to abduct him from North or South Waziristan and bundle him to the West, I reckon his debriefing could finally shut up the tiresome 9/11 conspiracy theory crowd. But that is another fantasy. The ‘truther’ movement is apparently impervious to reality and updated historical record keeping. You cannot have a serious debate with people who have made up their minds before they have heard the first question. It is highly unlikely Bahaji will live out a quiet retirement in the bazaars of Mir Ali or Miranshah. It is more probable that he will be collaterally assassinated in a CIA drone strike on some TTP big in a convoy along the border with Khost. In several ways, he is the ideal AQ operative being half Western and half Maghrebi. Adam Gadahn has nothing on Bahaji. The United States has made great strides in nailing AQ men in Pakistan’s cities-Ramzi bin al-Shibh in Karachi in 2002, KSM in Rawalpindi in 2003, and ObL in Abbottabad in 2011. It has had much, much less success in FATA where Pakistan’s writ is barely existent in many swaths of the tribal belt. Instead the US has been going after TTP figures like Baitullah Mehsud and Qari Hussain Mehsud, essentially getting caught up in the sticky web of Pakistan’s varied and sundry internal conflicts rather than sticking to what should be very narrow goal. It seems the White House is “smokin’ ’em out” more than ever before as the drone programme shows no sign of letting up. But are we smoking out the right men? Should Langley be smoking out Islamabad’s internal enemies in a remote control dirty war? The security of Pakistan’s nuclear programme (from its own people) has become a raison d’être for supporting a hideously corrupt, loathsome Zardari government that has no friends other than the American tax payer and its PPP patrons. It is the perpetuation of a deadly inertia as policy writ large.